Are you getting bored of seeing same basic color scheme on your Windows 7 computer? 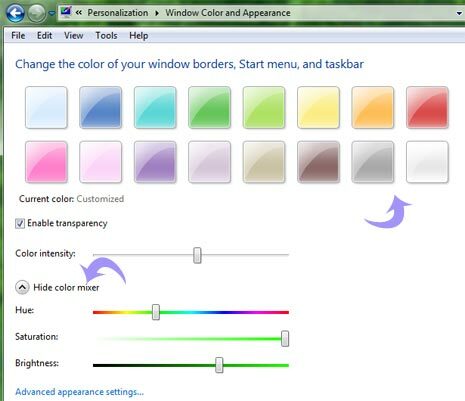 Get a fresh new and colorful look by changing the color scheme on your Windows PC. For this you don’t need to install any software or change current Windows theme. You can simply customize and change colors as per requirement to give fresh colorful look. 1. Right click on an empty space on your desktop. 2. Go to Personalize > Window Color (at the bottom). 3. You can Chose a custom color (from the list of the colors) or you can chose a different color by clicking on the Color Mixer icon. 4. Adjust the intensity of the color & when you are done with the color click on Save changes. So, next time Windows 7 appearance gets boring color-wise, just play around with different colors for refreshing colorful look. Easy, isn’t it? The topic-titel simply isnt right!